On the surface the band Twenty One Pilots are light years different from pop punk Green Day. First of all Twenty One Pilots are a keyboard centric band as opposed to the guitar centred music of Green Day. (This is more an ’80s/’90s thing as Green Day features pianos on some songs and Twenty One Pilots gets as close to a guitar as to have mandolin on some songs.) GreenDay features no rap and has guitar solos. Twenty One Pilots rarely solo, even on keys, and is much more likely to have a rap verse in their songs. Still the evidence of TOP being Green Day fan boys is of consequence. Both are small bands. Green Day existed as three piece for the majority of their career. Only on the 2012 albums did they add a second guitarist. As I understand it TOP started out as a three piece but for their only two signed albums they are just a two piece band. Maybe both bands just would rather not get in the way of their fellow band mates. The name Twenty One Pilots comes from an Arthur Miller play about a man that sold faulty airplane parts in World War II that cause the death of twenty – blah, blah, blah. We all really know that TOP was formed with that name at the end of 2009 a year noted for one of the best Green Day songs ever – Twenty-One Guns. Of course TOP stole the number from this song and finding a noun to attach the number to was easy as everybody wants to be a pilot. But the most convincing evidence of all came with the release of their current album, Blurry Face. Green Day has a habit of arranging their songs on the album in a way that leaves a high at the start, a slump in the second act and a high or climax at the end. I proved it with the graphs on this previous post. 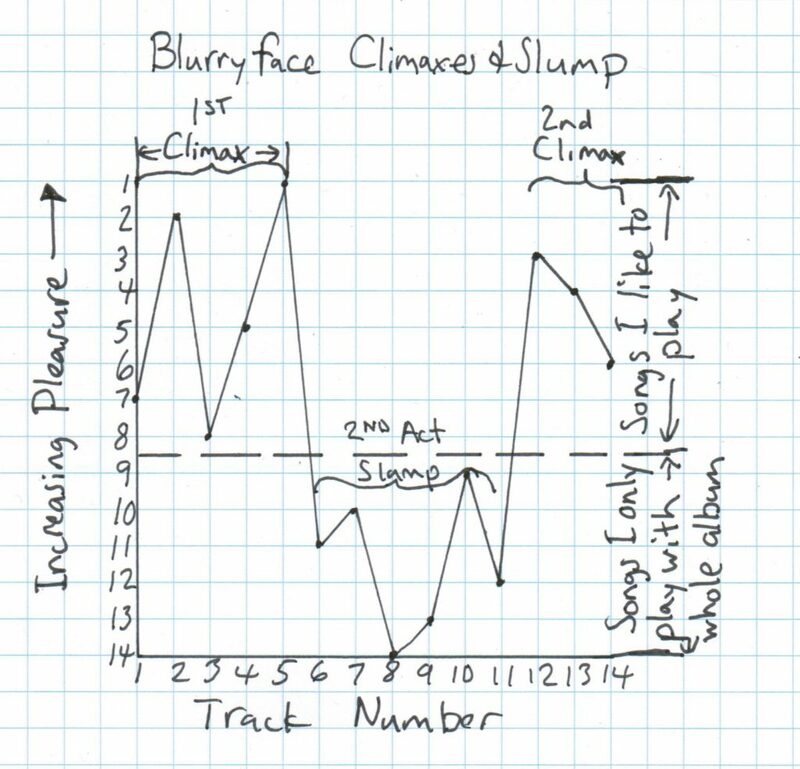 So now let me graph Blurry Face with Increasing Pleasure versus Song Placement axes. The second act slump is rather obvious. I contend that TOP stole this idea from Green Day. And why not? It only seems to work on an album where most of the songs are quite likeable. So it has been proved that Twenty One Pilots are Green Day fan boys. Earlier I mentioned that Green Day was a pop punk band. There’s a label that some are trying to attach to TOP , I just don’t agree with it. Some call them schizophrenic pop because they are supposed to bridge genres. I disagree with this moniker. Schizophrenics are “split brained” in that part seems conscious while another part of their brain seems totally different or from the outside. Schizophrenics are unaware that their brains have multiple, thinking parts. Instead they ‘hear voices’. TOP are quite aware of their multi faceted music. Perhaps they could be called kaleidoscope pop. In that when you spin it, something new pops out. I just want to have this name used before its time is up. Spinning music on CD or record is much rarer now than it used to be and might eventually disappear altogether. This entry was posted in Humour, Mathematics, Music and tagged 2nd act slump, Blurry Face, down with the term schizophrenic pop, early climax, end climax, everybody wants to be a pilot, graphing fun with TOP, Green Day, Green Day are guitar centric, Green Day is pop punk, rap verse seems to have replaced the guitar solo, small bands, TOP is kaleidoscope pop, TOP is keyboard centric, Twenty One Pilots, Twenty One Pilots is really from an Arthur Miller play, Twenty-One Guns. Bookmark the permalink.